Friday I went with my daughter's school to Memphis . 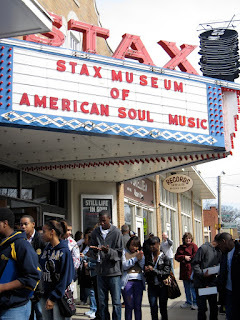 The first stop was the STAX Museum of American Soul. It was well worth the trip just to see this. Fantastic museum with something for everyone. The kids ate lunch there while we took off for the Pink Palace museum. The boys really wanted to do the Children's Museum (which is awesome too) but they are no longer in the ASTC and I couldn't justify paying $50 for the less than an hour we had to play. They had a great exhibit on the history of chocolate which made us all very hungry! We ran from there to meet the kids at the National Civil Rights Museum. This was a powerful museum. Very emotional. It's amazing that so much happened in our nation, not so long ago. 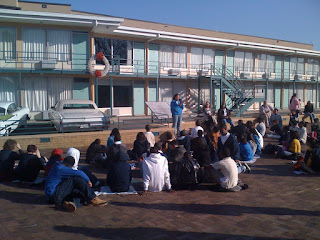 The teacher that organized the trip played Dr. King's last speech at the end of the tour and had the kids sit outside (where MLK was shot) to listen. I can't get over how intuitive this speech was. 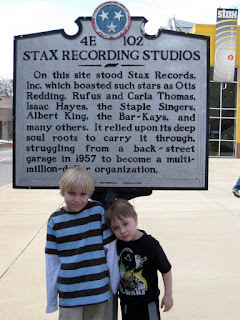 "And then I got to Memphis. And some began to say the threats, or talk about the threats that were out. What would happen to me from some of our sick white brothers? Well, I don't know what will happen now. We've got some difficult days ahead. But it doesn't matter with me now. Because I've been to the mountaintop. And I don't mind. Like anybody, I would like to live a long life. Longevity has its place. But I'm not concerned about that now. I just want to do God's will. And He's allowed me to go up to the mountain. And I've looked over. And I've seen the promised land. I may not get there with you. But I want you to know tonight, that we, as a people, will get to the promised land. So I'm happy, tonight. I'm not worried about anything. I'm not fearing any man. Mine eyes have seen the glory of the coming of the Lord." Wow...what an amazing class trip! I'd actually like to go on that one!